Neuropsychological associations can be considerable in occlusal dysesthesia (OD) patients who routinely complain of persistent occlusal discomfort, and somatization effects in the superior medial prefrontal cortex and the temporal and parietal regions are also present. However, the relationship between physical activity, i.e., chewing, prefrontal cognitive demand, and psychiatric states in OD patients remains unclear. We investigated this relationship in this study. OD patients (n = 15) and healthy control (n = 15; HC) subjects were enrolled in this study. Occlusal contact, chewing activities of the masticatory muscles, prefrontal activities, and psychiatric states such as depression and somatization, of the participants were evaluated. Functional near-infrared spectroscopy was used to determine prefrontal hemodynamics and the Symptom Checklist-90-R was used to score the psychiatric states. We observed a significant association between prefrontal deactivation during chewing and somatization subscales in OD patients. Further, there were no significant differences with regard to the occlusal state and chewing physical activities between the OD patients and HC subjects. Chewing-related prefrontal deactivation may be associated with somatization severity in OD patients. fNIRS is a functional imaging method that uses the principal of neuro-vascular couplings. It is applicable for evaluation of psychiatric state based on prefrontal cortex blood flow in patients with psychiatric disorders. Persistent occlusal discomfort is a common complaint among occlusal dysesthesia (OD) patients [1, 2, 3, 4] who, in the presence of depression, schizophrenia, panic, or somatoform disorders [5, 6, 7, 8], present with numerous neuropsychological associations. From a clinical standpoint, Tsukiyama et al. recommended a psychosomatic evaluation for diagnosis, and Reeves JL and Merrill RL , and Toyofuku et al. also recommended cognitive behavioral therapy and anti-depressants for the treatment of OD patients. 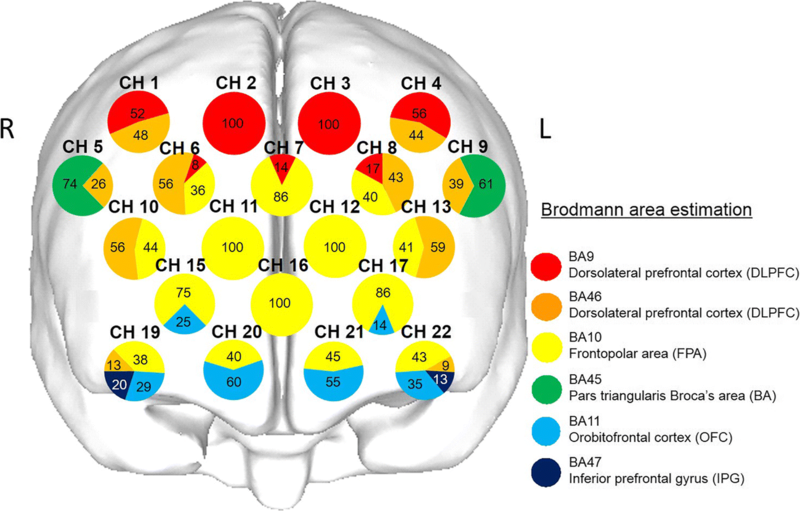 Neuropsychological evidence for somatization and somatoform disorders has shown cortical associations with the superior medial prefrontal cortex, temporal region, and parietal region [9, 10, 11, 12, 13]. For example, Su et al. reported a positive relationship between somatization subscale and bilateral superior medial prefrontal activities in patients with somatoform pain disorders. With regard to somatization in the oral region, Ono et al. recently examined prefrontal activity and tooth contact sensation in relation to tooth grinding, and they found that increased prefrontal hemodynamic responses may reflect top–down attention and/or self-regulation against uncomfortable somatosensory input induced in OD patients. In addition, Umezaki et al. reported that temporal hyperperfusion was improved along with alleviation of oral cenesthopathy in a clinical study. In relation to self-evaluation of sensory perception, the prefrontal cortices, principally the dorsolateral prefrontal cortex (DLPFC) and the medial prefrontal cortex (m-PFC), may be physiologically and pathologically involved in cognitive and metacognitive functioning [16, 17, 18, 19, 20, 21]. In addition, possible modifications of prefrontal metacognitive deficits were also reported to occur in patients with psychiatric disorders [22, 23]. On the basis of these findings, we speculated that psychiatric patients complaining of OD may have a modulated prefrontal cognition and metacognition in association with psychological states. Chewing is understandably a sensorimotor and multisensory cognitive function [24, 25, 26]. The central executive network including the DLPFC may be involved in chewing execution and the default module network including the m-PFC may be involved in multisensory cognitive functioning [27, 28], self-decisions, and self-evaluations for food choice and food reward in regard to chewing performance [29, 30, 31, 32]. Thus, if these prefrontal activities are modulated in individuals with psychiatric disorders during chewing, multisensory cognitive dysregulation could be expected in patients complaining of OD, independent of occlusal state and the behavioral aspects of chewing. With these factors in mind, we speculated that comprehensive modification of prefrontal cognitive and metacognitive participation may be present in OD patients with psychiatric conditions. In the present study, we examined prefrontal participation during chewing performance to clarify chewing cognitive deficits in the patients affected by OD, as well as chewing activities by the masticatory muscle and jaw movement activities and occlusal contact conditions. We employed functional near-infrared spectroscopy (fNIRS) to evaluate prefrontal cognitive abilities during chewing, as this technique is considered suitable for examination of prefrontal chewing activities. Several studies have been conducted to define prefrontal cognitive functioning in regard to food flavor , food hardness , and sensorimotor generation  during chewing. In the present study, we investigated specific behaviors that might be modulated by occlusal contact conditions in OD patients. 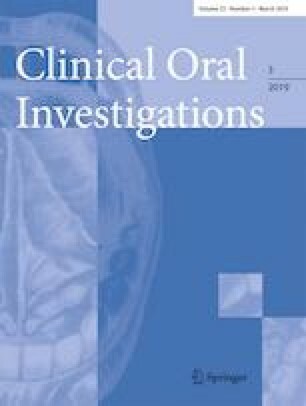 The purpose of our investigation was to obtain better understanding of features associated with prefrontal cognitive and metacognitive functioning during chewing and psychiatric states in OD patients, which might be independent of the physical demands related to chewing behavior and occlusal contact state. This study was conducted from February 2011 to August 2013 at the Department of Temporomandibular Joint Pain and Dysfunction of Nihon University School of Dentistry at Matsudo Hospital, Japan. Based on proposals by Melis and Zawawi , the study population included OD patients who persistently complained of uncomfortable bite sensation for at least 6 months in the absence of dental occlusal discrepancies, such as centric prematurity or nonworking interference, or when the complaints were disproportionate to those conditions . Fifteen OD patients, 8 males and 7 females, with a mean age of 49.9 ± 16.1 years were investigated, and the results were compared to those obtained from 15 age- and gender-matched (Fisher’s exact test and Z test) HC subjects (8 males, 7 females; age 39.3 ± 15.3 years). Clinical examinations were conducted by 2 dentists, 1 of whom was a prosthodontics specialist. The 15 OD patients in this study had complained of uncomfortable bite sensation for more than 1 year. Additionally, the OD patients had no symptoms such as periodontal disease, pulpitis, temporomandibular disorders based on RDC/TMD , or myofascial pain disorders. The HC subject group was recruited from staff working at Nihon University School of Dentistry at Matsudo and had no dental occlusal discrepancies, no complaints or awareness of occlusal dysesthesia, and no symptoms such as periodontal disease, pulpitis, temporomandibular disorders based on RDC/TMD , or myofascial pain disorders. The sample size, determined using the G*Power 3 software package (noncommercial program downloaded from University of Dusseldorf, Germany) , was estimated to be 10.67, which, for the parameters established in this study, provided a significance level of 0.05 and statistical power of 0.8. Of the 15 OD patients, 9 had a history of psychiatric examinations for psychiatric disorders, and had been prescribed anti-depressant and/or anxiolytic medications. Initially, all subjects were examined for psychological state using the Symptom Checklist-90-R (SCL-90-R) [38, 39]. 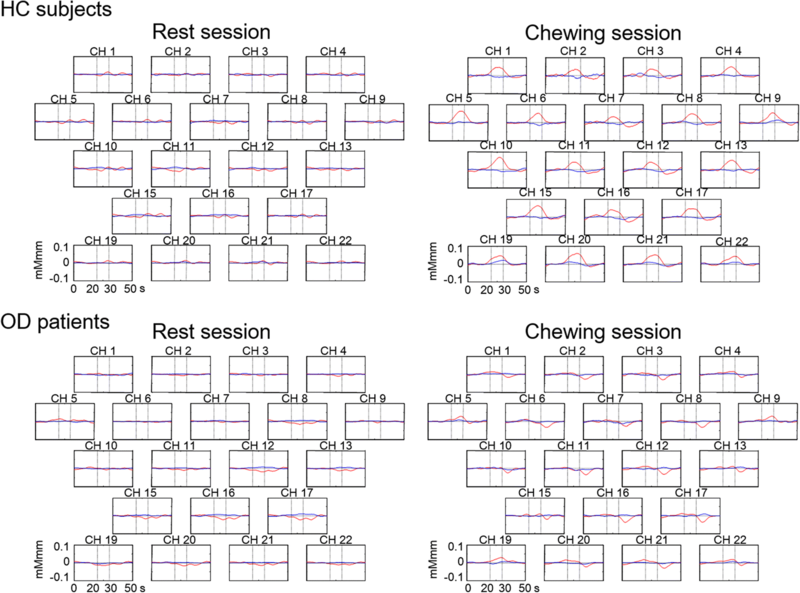 Additionally, prefrontal cortical activities were simultaneously recorded during chewing in order to further evaluate whether prefrontal activities during chewing were associated with somatization subscale scores obtained with the SCL-90-R [38, 39]. We also determined occlusal status in terms of occlusal force and occlusal contact area using the Dental Prescale occlusal diagnostic system (Fujifilm Corp., Kuala Lumpur, Malaysia), because chewing-related prefrontal activity and occlusal discomfort during chewing are modulated not only by psychiatric state, but also by alterations of the oral environment, such as tooth loss , occlusal interference, and malocclusion . The fNIRS measurements did not interfere with the EMG electrodes or jaw movement tracking while evaluating chewing performance in this study (Fig. 1). All patients filled out a modified SCL-90-R [38, 39], which is a brief and multidimensional self-reported inventory designed to help clinicians screen for a broad range of psychological problems and symptoms related to psychopathologies. SCL-90-R findings provide both a depression scale and a scale measuring the severity of nonspecific physical symptoms (somatization subscale), which can be used as part of Axis II assessment [38, 39]. A typical chewing session consisted of 5 trials with chewing gum (Freezone, Lotte Co., Tokyo, Japan) and bilateral chewing was performed in each session. A chewing trial lasted for 10-s, with 40-s inter-trial phases. For the chewing task, we used a single piece of chewing gum, and the start and end of each trial was indicated to the participant by verbal commands. The subjects were instructed to be quiet until given a verbal cue during the pre-chewing period. After the verbal cue to start, they were instructed to chew the gum for 10 s as the chewing period until the next verbal cue instructing them to stop chewing. fNIRS measurements were performed in all subjects during the rest session, during which there was no task performance. 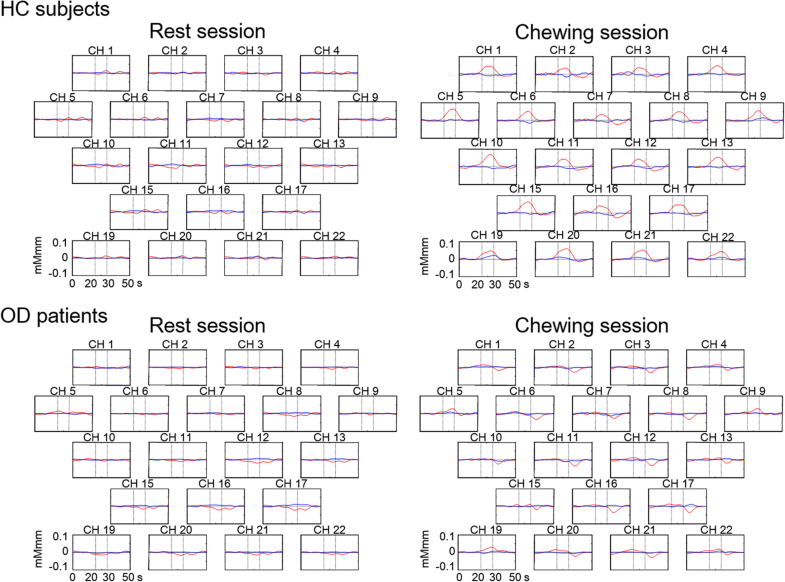 To avoid the influence of the session sequence on the results, the subjects were asked to perform the chewing and rest sessions in a randomized order. Masticatory muscle activities were recorded using surface EMG electrodes. A pair of bipolar Ag/AgCl electrodes of 7-mm diameter were attached to skin overlying the corresponding muscle. The electrodes were positioned bilaterally on the center of the masseter (Mm), anterior temporal (Ta), and anterior digastric (AD) muscles parallel to the direction of the muscle fibers, with an inter-electrode distance of 20 mm. A ground electrode was attached to the left ear lobe. EMG signals were amplified (AMPL 1253A, San-ei MED, Tokyo, Japan), with the high frequency cutoff filter set at 1 kHz and a time constant of 0.03 s and EMG data were analyzed for cycle duration of AD muscle, burst duration, inter-burst duration, integrated area (Area), mean amplitude, and peak amplitude of the Mm, Ta, and AD muscles during each chewing cycle. Jaw movement activities were recorded using a MKG computer system (K7-I, Myo-Tronics, Seattle, Wash, USA). The position of the magnet attached to the buccal surface of the lower central incisor is set at zero in the intercuspal position. Jaw movements were analyzed in vertical movement (mm), anteroposterior movement (mm), lateral movement (mm), jaw-opening velocity (mm/s), and jaw-closing velocity (mm/s). Bilateral maximal occlusal force and contact area were measured using 97-μm-thick pressure-sensitive sheets (Dental Prescale 50H R-type, Fuji Film Co., Tokyo, Japan) during maximal clenching performance in the intercuspal position, and occlusal data was calculated by a precalibrated scanning device (Occluzer FPD703, Fuji Film Co., Tokyo, Japan) in terms of occlusal force (N), asymmetrical index (AI) for occlusal force (%), moment (N cm), average pressure (MPa), and maximum pressure (MPa), as well as occlusal contact area (mm2) and AI for occlusal contact area (%). Coordinates for all probe and anatomical landmark (Nz, Iz, A1, A2, and Cz) positions were obtained using a 3-dimensional digitizer (3SPACE ISOTRAK2, Polhemus, VT, USA) and transcribed into Montreal Neurological Institute standard brain space  using probabilistic registration . Probe positions were then projected onto the cortical surface and the anatomic localization corresponding to each probe coordinate was identified using Platform for Optical Topography Analysis Tools (POTATo, Hitachi, Tokyo, Japan), with reference to the Brodmann area . 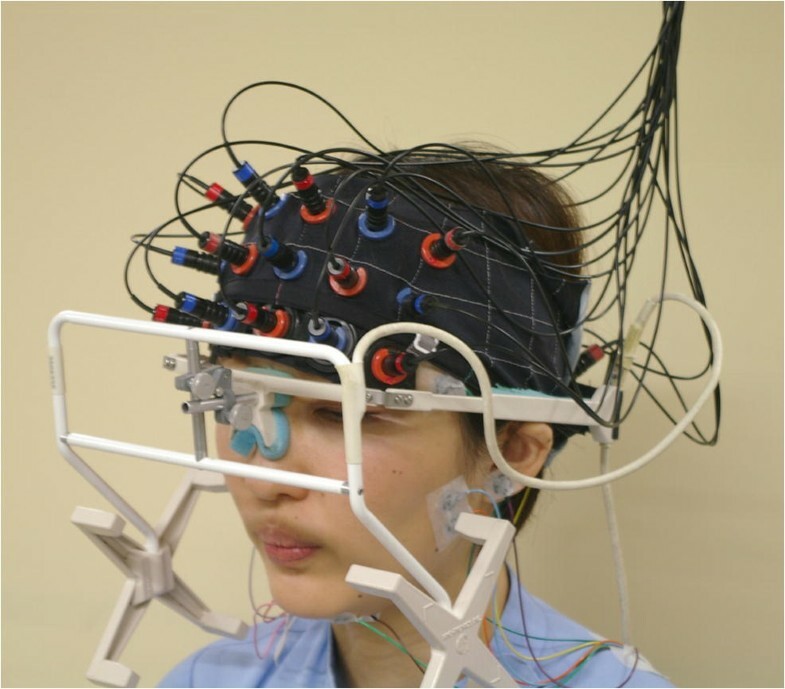 Prefrontal activity was assessed using a 22-channel fNIRS device (ETG-100, Hitachi Medical Co., Chiba, Japan), which utilizes near-infrared light at two wavelengths: 780 and 830 nm . The distance between each pair of detector probes was 3.0 cm and the device was set to measure at points associated with the surface of the cerebral cortex . The probes were fitted with 3 × 5 thermoplastic shells and placed in the prefrontal region, whereas the bottom lines of the fNIRS probes were set according to FP1 and FP2, with referral to the international 10–20 system . Change in [oxy-Hb] was used as an indicator of change in regional cerebral blood volume, as that has been reported to be more sensitive than [deoxy-Hb] as a parameter for measuring blood flow change associated with brain activation  and has a strong correlation with blood-oxygenation-level-dependent signals measured by fMRI . The sampling interval was 0.1 s. During the measurements, the subjects were instructed to open their eyes and gaze at a point in front of them. Each trial was repeated five times and obtained values were averaged using the “integral mode” of the ETG-100 software for the chewing sessions. Channels 14 and 18 showed a decrease in [oxy-Hb] preceding performance of the chewing task, indicating appearance of [oxy-Hb] artifacts probably caused by preliminary strain related to temporal muscle and/or jaw movement activities. Those channels were excluded from the fNIRS measurements. Anatomical location of the fNIRS channels has been shown in Fig. 2. These channels were localized in the dorsolateral prefrontal cortex (DLPFC), frontopolar area (FPA), pars triangularis Broca’s area (BA), orbitofrontal cortex (OFC), and inferior prefrontal gyrus (IPG). Each circle corresponded to a channel and the pie chart within each circle in Fig. 2 shows the percentage of areas in that channel (Fig. 2). For statistical analyses of masticatory muscle and jaw movement activities, and occlusal status between the OD patients and HC subjects, we used t test or Mann–Whitney rank sum test. The value for [oxy-Hb] was calculated at 1-s intervals and compared between the rest and chewing sessions, and between the OD patients and HC subjects using paired t test or t test implemented with a plug-in-based analysis platform that runs on MATLAB (The MathWorks Inc. MA, USA). A topographical representation of significant (p < 0.05) channels every 1 s was projected onto the occipital cortical surface of a Montreal Neurological Institute standard brain space  using a 3-dimensional composite display unit (version 2.41, Hitachi Medical Co. Chiba Japan) . Two-way ANOVA was applied, and a Bonferroni t test was used for multiple comparisons between the OD patients and HC subjects, and between OD patients with and without a history of psychiatric examinations for the time course of averaged data for accumulated [oxy-Hb] in the pre-chewing, chewing, and post-chewing periods. Furthermore, Spearman’s rank order correlation coefficient was used to estimate relationships among [oxy-Hb] data accumulated from 20 channels in the chewing period, and depression scale, somatization scale, and somatization without pain scale. In addition, statistical examinations, for masticatory muscle EMG and jaw movement activities, and occlusal condition, were also conducted with t test or Mann–Whitney rank sum test between the nine OD patients with a history of psychiatric conditions and the six OD patients without such a history. Fisher’s exact test was used to evaluate the gender difference between OD patients and HC subjects, and Z test was also used for evaluating the gender difference between OD patients with and without a history of psychiatric examinations. The statistical software package SigmaPlot 12.5 (Systat Software Inc., CA, USA) was used for all analyses and p values of < 0.05 were considered to indicate significance. Nine of the OD patients had a history of psychiatric conditions, including depression in 3 males and 1 female, anxiety disorder in 1 male and 1 female, somatoform disorder in 1 male, panic disorder in 1 female, and schizophrenia in 1 female (Table 1). Numerical rating scale (NRS, 0–10) scores for the intensity of occlusal dysesthesia ranged from 6 to 10, while the average and standard deviation (SD) value was 8.0 ± 1.4 in the 15 OD patients (Table 1). The period of distress ranged from 1 to 9 years, and the average and standard deviation (SD) value was 2.9 ± 2.4 years (Table 1). In contrast, HC subjects had no complaints as observed in OD group and no psychiatric conditions. The SCL-90-R scores for depression, somatization, and somatization without pain for 15 OD patients were 1.77 ± 0.60, 1.29 ± 0.54, and 1.13 ± 0.64, respectively; which were found to be significantly higher (p < 0.01, Mann–Whitney rank sum test) than scores in HC subjects that were 0.07 ± 0.12, 0.04 ± 0.08, and 0.03 ± 0.08, respectively (Fig. 3). There was no significant (t test or Mann–Whitney rank sum test) differences between the OD patients and HC subjects in the cycle duration for AD muscle EMG activity, and burst durations, inter-burst durations, area, mean amplitude, and peak amplitude for Mm, Ta, and AD muscle EMG activities (Table 2). Similarly, vertical, anteroposterior, and lateral jaw movement activities, as well as jaw-opening and jaw-closing velocity were found to be not significantly (t test or Mann–Whitney rank sum test) different between the OD patients and HC subjects (Table 3). Moreover, occlusal contact area, occlusal force, moment, average pressure, maximum pressure, and occlusal contact area AI, or occlusal force AI were also found to be not significantly (t test or Mann–Whitney rank sum test) different between the OD patients and HC subjects (Table 4). The grand averaged waveforms for changes in [oxy-Hb] and [deoxy-Hb] during the rest and chewing sessions have been shown in the OD patients and HC subjects (Fig. 4). The HC subjects showed a marked increase [oxy-Hb] as the grand-average wave form in chewing period, as compared to the rest period. In contrast, the OD patients presented slight changes in [oxy-Hb] for chewing period as compared with the rest period (Fig. 4). The values for [oxy-Hb] in the pre-chewing period were significantly (p < 0.05, paired t test) increased in DLPFC, DLPFC/FPA, FPA, BA/DLPFC, and OFC/FPA, as compared to those in the pre-rest period (Fig. 5a, Table 5a). 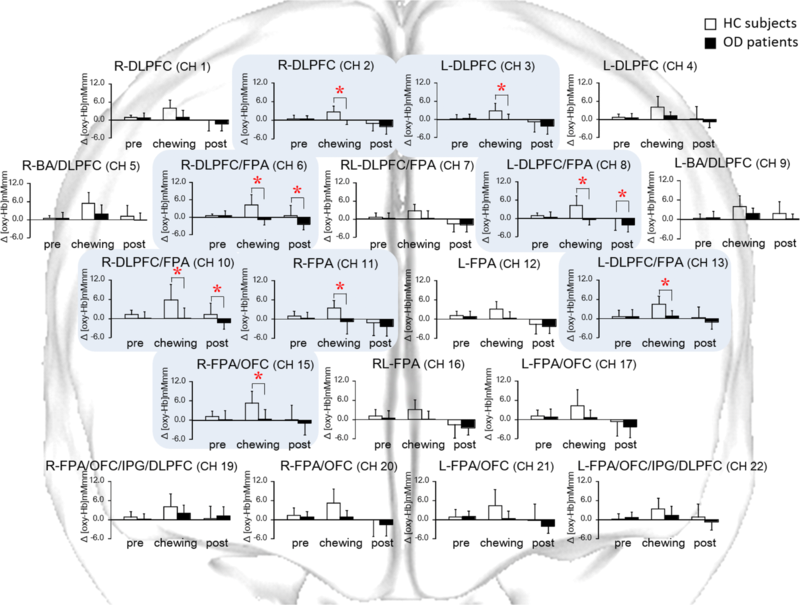 The values for [oxy-Hb] in the chewing period were significantly (p < 0.05, paired t test) increased in DLPFC, DLPFC/FPA, FPA, BA/DLPFC, OFC/FPA, and FPA/OFC/IPG/DLPFC, as compared to those in the rest period (Fig. 5a, Table 5a). The values for [oxy-Hb] in the post-chewing period were significantly (p < 0.05, paired t test) increased in BA/DLPFC, as compared to post-rest period (Fig. 5a, Table 5a). OD patients demonstrated values for [oxy-Hb] in the pre-chewing period that were significantly (p < 0.05, paired t test) increased in DLPFC, DLPFC/FPA, FPA, OFC/FPA, and FPA/OFC/IPG/DLPFC, as compared to those in the pre-rest period (Fig. 5b, Table 5b). 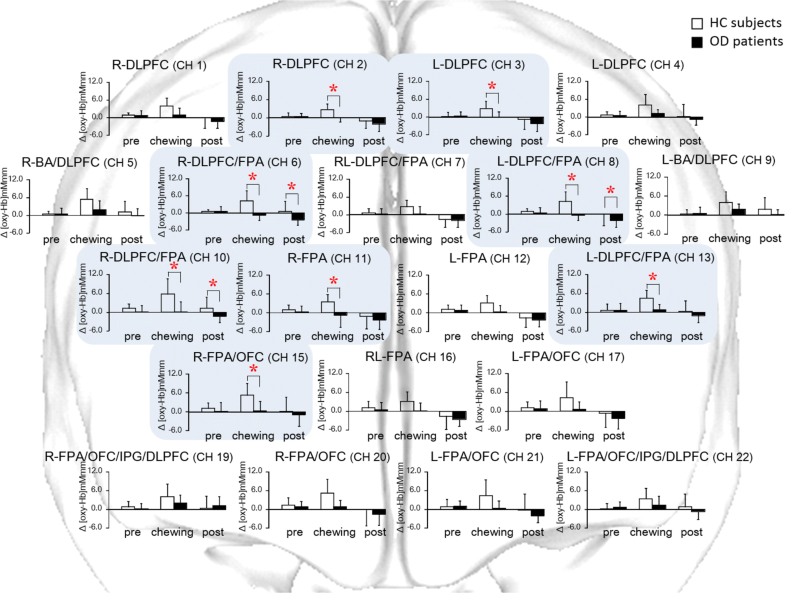 The values for [oxy-Hb] in the chewing period were significantly (p < 0.05, paired t test) increased in DLPFC, DLPFC/FPA, FPA, BA/DLPFC, OFC/FPA, and FPA/OFC/IPG/DLPFC, as compared to those in the rest period (Fig. 5b, Table 5b). The value for [oxy-Hb] in the post-chewing period was significantly (p < 0.05, paired t test) increased in FPA/OFC/IPG/DLPFC as compared to those in the post-rest period, while the values for [oxy-Hb] in the post-chewing period were significantly (p < 0.05, paired t test) decreased in DLPFC, DLPFC/FPA, FPA, and OFC/FPA, as compared to those in the post-rest period (Fig. 5b, Table 5b). In a comparison between the OD patients and HC subjects during the rest session, the values for [oxy-Hb] of the OD patients in the pre-rest period were significantly (p < 0.05, t test) decreased in DLPFC, and increased in DLPFC/FPA and BA/DLPFC, as compared to those in the HC subjects (Fig. 5c, Table 5c). The values for [oxy-Hb] of the OD patients in the rest period were significantly (p < 0.05, t test) decreased in DLPFC, DLPFC/FPA, FPA, OFC/FPA, and FPA/OFC/IPG/DLPFC, as compared to those of the HC subjects. In contrast, the values for [oxy-Hb] of the OD patients in the rest period were significantly (p < 0.05, t test) increased in BA/DLPFC as compared to those of the HC subjects (Fig. 5c, Table 5c). The values for [oxy-Hb] of the OD patients in the post-rest period were significantly (p < 0.05, t test) decreased in OFC/FPA and FPA/OFC/IPG/DLPFC, as compared to those in post-rest period of the HC subjects (Fig. 5c, Table 5c). The values for [oxy-Hb] of the OD patients in the chewing period patients were significantly (p < 0.05, t test) decreased in DLPFC, DLPFC/FPA, FPA, BA/DLPFC, and OFC/FPA, as compared to those in the HC subjects (Fig. 5d, Table 5d). On the basis of the results of statistical comparisons between the OD patients and HC subjects during the chewing session, we performed two-way ANOVA on data for accumulated [oxy-Hb] from all channels. The significant interactions between the OD patients and HC subjects were presented for time at CH 2 (F = 3.591, p = 0.032, power of performed test 0.494), CH 3 (F = 3.635, p = 0.031, power of performed test 0.502), CH 6 (F = 8.023, p < 0.001, power of performed test 0.932), CH 8 (F = 4.894, p = 0.010, power of performed test 0.690), CH 10 (F = 4.214, p = 0.018, power of performed test 0.594), CH 11 (F = 3.388, p = 0.038, power of performed test 0.459), CH 13 (F = 4.576, p = 0.013, power of performed test 0.647), and CH 15 (F = 3.515, p = 0.034, power of performed test 0.481). In the OD patients, there were significant (p < 0.05, Bonferroni t test) decreases in the [oxy-Hb] values for DLPFC, DLPFC/FPA, FPA, and FPA/OFC in the chewing period, and for DLPFC/FPA in the post-chewing period, as compared to the HC subjects (Fig. 6). HC subjects did not show any significant (Spearman’s rank order correlation) correlations for any of channels between accumulated [oxy-Hb] in the chewing period and SCL-90-R scores for depression, somatization, and somatization without pain. 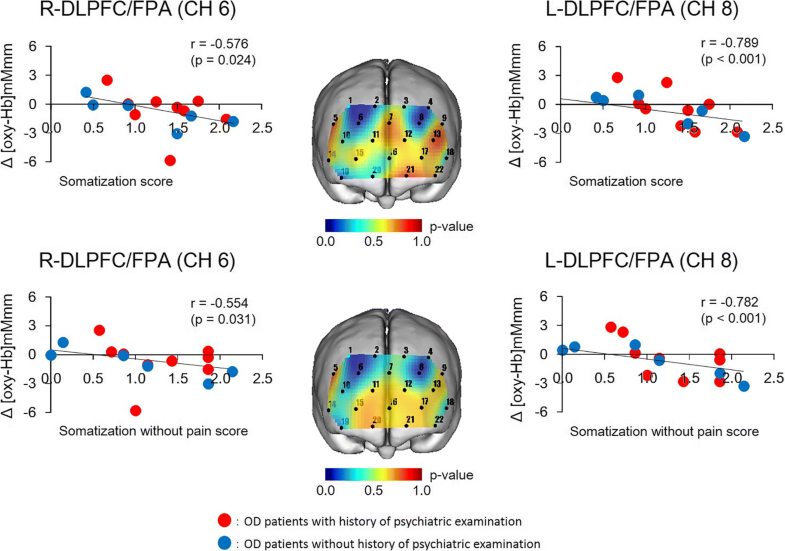 As for the OD patients, significant (Spearman’s rank order correlation) correlations, between accumulated [oxy-Hb] in the chewing period and SCL-90-R scores in somatization score and somatization without pain score, were seen in right DLPFC/FPA (CH 6) and left DLPFC/FPA (CH 8) (Fig. 7). In OD patients with and without history of psychiatric examinations, there were no significant differences (t test or Mann–Whitney rank sum test) in intensity of occlusal discomfort and disease duration. Similarly, there was no significant difference (p < 0.05, t test) between SCL-90-R score for depression, somatization, and somatization without pain (Table 6). In OD patients with and without history of psychiatric examinations, there were no significant differences (p < 0.05, t test or Mann–Whitney rank sum test) in regard to masticatory muscle activities, vertical movement, anteroposterior movement, lateral movement, open velocity and close velocity, and occlusal condition in occlusal contact area, force, moment, average pressure, maximum pressure, occlusal contact area asymmetry index (AI), and occlusal force AI (Table 7). 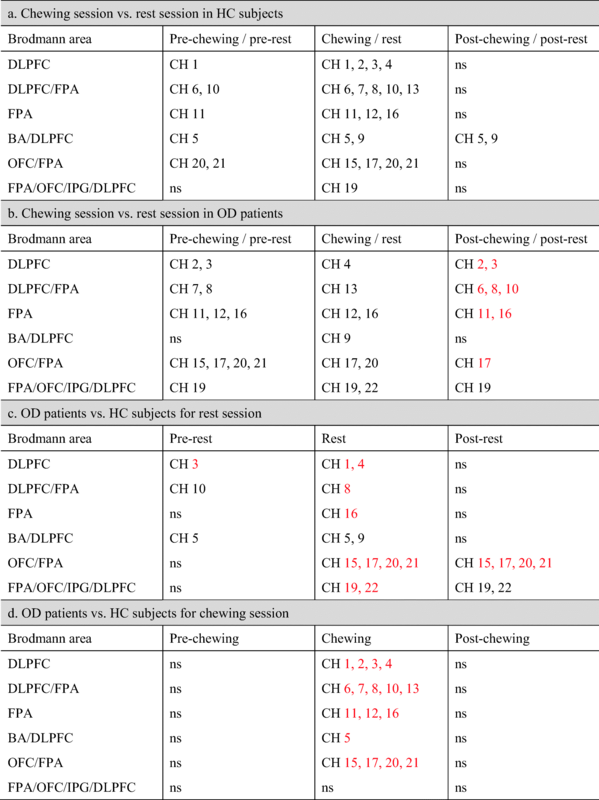 In OD patients with and without history of psychiatric examinations, there were no significant (p < 0.05, two-way ANOVA and a Bonferroni t test) differences between the two groups in the values for [oxy-Hb] in the pre-chewing, chewing, and post-chewing periods (Table 8). OD patients with and without history of psychiatric examinations were found to be similarly distributed in the correlation diagrams between accumulated [oxy-Hb] in the chewing period and SCL-90-R scores in somatization and somatization without pain (Fig. 7). Here, for the first time, we report that OD patients had a significant association of prefrontal deactivation during chewing with the severity of somatization, as per the SCL-90-R scoring. On the other hand, OD patients did not demonstrate any significant modifications of occlusal state or chewing activities as compared to HC subjects. It has been previously reported that prefrontal activity during chewing is involved in food preference , self-evaluation of chewing ability [35, 40], food reward , food representation, and monitoring of eating behavior . Furthermore, the DLPFC and m-PFC are also involved in multisensory sensory functioning as well as execution, attention, and working memory participations [25, 26, 27, 28, 29, 32]. Considering the functional convergence in prefrontal cognitions  and its deactivation in psychiatric patients [22, 23], it is conceivable that the comprehensive cognitive and metacognitive capacities such as subjective evaluation of somatic sensory cognition might be modulated in OD patients. Furthermore, cortical modifications associated with somatoform states have been suggested in m-PFC function [9, 10, 11, 12, 13]. In the present study, we found not only prefrontal deactivation during chewing but also found associated deterioration of somatization scores in OD patients. Furthermore, considering participation of the prefrontal cortex in self-related cognitive functioning [16, 17, 18, 19, 20, 21] and its psychological associations [22, 23], the deactivation of the prefrontal cortex in the DLPFC and m-PFC in OD patients during chewing may suggest the metacognitive perceptual disability for the self-evaluation of occlusal tooth sensation [29, 54]. We also found negative associations between chewing-related prefrontal activities and somatization score in the OD patients but no significant differences in occlusal states and chewing behavior. 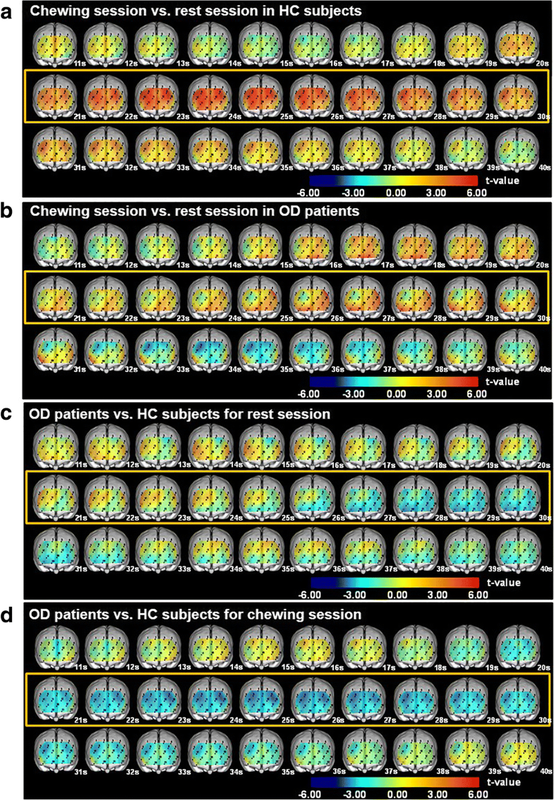 Hence, it is evident that the significant associations between prefrontal deactivation during chewing and somatization severity in the OD patients suggest that there may be dissociation between prefrontal cognitive capacity and physical chewing activities in OD patients. Examination of the somatization state using the SCL-90-R subscales for the head, chest, back, stomach, arms, and legs, highlighted a significant positive association between SCL-90-R scores and chewing-related prefrontal deactivation in OD patients. Therefore, despite the fact that the chief complaints of OD patients are related to occlusal somatic symptoms, they may be expressed as the somatic discomfort in whole body. Recent studies found that TMD  and OFP [56, 57] patients experienced somatic spreading of pain symptoms in congruence with their psychiatric state progression. From these findings [55, 56, 57], one could suggest that symptoms in OD patients spread throughout the body depending on somatization severity. Further analyses by subdividing the OD patients according to their history of psychiatric evaluations demonstrated no influence on the occlusal contact state, masticatory muscle and jaw movement activities, and prefrontal activities during chewing. It is therefore conceivable that OD patients without history of psychiatric examinations may already be presenting with psychiatric disorder without a formal diagnosis. Thus, prefrontal activity markers during chewing and somatic state examinations, such as SCL-90-R, may be useful in clinical settings to analyze the neuro-pathological background in patients complaining of persistent OD. This suggestion is in line with previous research results showing that fNIRS is a functional imaging method that relies on the principal of neuro-vascular couplings and applicable for evaluation of psychiatric state using prefrontal cortex blood flow in patients with psychiatric disorders [22, 23, 58, 59, 60, 61, 62, 63]. As routine practice, oral medication [3, 4] and cognitive behavioral therapy  are recommended for treatment of OD patients. Recently, neuromodulation therapy has been clinically recommended for treating cognitive deficits in psychiatric disorders [64, 65, 66, 67, 68]. Our results in this study may suggest that prefrontal modulation in OD patients might be treated by using repetitive transcranial magnetic stimulation (rTMS) or transcranial direct current stimulation (tDCS) in a dental clinic. Additional studies are warranted to further understand the potential treatment options emerging form this pilot study, but it is likely that cognitive and metacognitive functional deficits may be associated with the networking modifications not only in the prefrontal cortex but also in the posterior parietal and anterior temporal cortices in the patients complaining of persistent OD [69, 70]. This study used SCL-90-R scoring, which is a quick tool to evaluate psychiatric states. More accurate and comprehensive medical examinations by specialists are necessary in future studies to clarify the relationships between psychiatric states and prefrontal somatosensory cognition in OD patients. OD symptom is a comorbidity in patients with psychiatric disorders, and our examination of OD patients showed a significant relationship between prefrontal deactivation during chewing and somatization severity but not with the occlusal state and chewing activities. Moreover, no significant differences in the psychiatric states, masticatory muscles, jaw movement, and prefrontal cortical activities during chewing, and occlusal condition were observed in OD patients with or without a history of psychiatric examination. Hence, we concluded that periodontal sensation in patients with persistent OD might not be normally generated in regard to higher-order somatosensory cognitive and metacognitive functioning, which might be associated with the psychiatric states in OD patients. We would like to appreciate Shingo Kawasaki for excellent technical assistance. All procedures performed in studies involved were in accordance with the ethical standards of the institutional and/or national research committee and with the 1964 Helsinki Declaration and its later amendments or comparable ethical standards. The study was approved by the Ethics Committee of Nihon University School of Dentistry at Matsudo (No. EC 14-13-010-1).